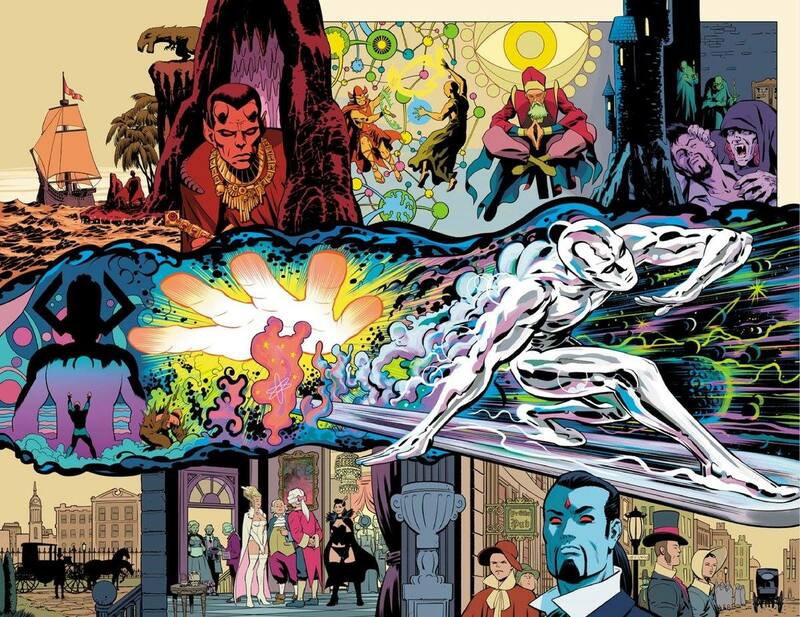 The seven shared pages feature scenes spanning galaxies and millenia, with characters like the Silver Surfer, Odin, the Celestials, the Living Tribunal, the Rawhide Kid, Wolverine, and the Phoenix of 1,000,000 BC all making appearances. Rodriguez and López are fresh off the twelve-issue run of the recent Exiles series, where they got to imagine at least one brand-new alternate reality in every issue. Giving them the entirety of the Marvel Universe—past, present, and future—to work with the next logical step. Intentional or not, these pages remind me of the look of 1986’s The History of the DC Universe by Marv Wolfman and George Pérez, which featured a series of tableaus of important characters and moments from throughout the DCU (which had just recently been rewritten as a result of Crisis on Infinite Earths). Check out larger versions of the shared pages below. The History of the Marvel Universe is scheduled for release in July. Awesome art, and timely series. Definitely agree that the composition of these pages reminds me of George Pérez.